BOSTON, Mass. 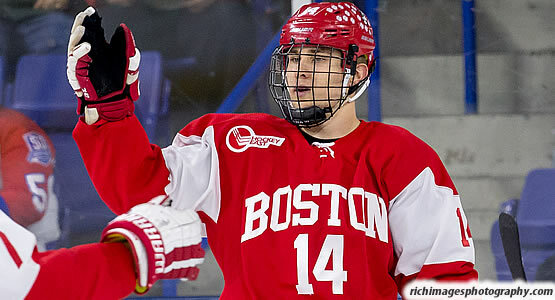 - Junior Bobo Carpenter scored two goals and assisted on another to help the Boston University men's ice hockey team post a 3-1 home win and complete a weekend sweep of Merrimack on Saturday evening at Agganis Arena. The Terriers' special teams made the difference, going 2-for-4 on the power play and killing off all seven of the Warriors' chances with the man advantage. BU, which extended its unbeaten streak to four games (3-0-1), improves to an even 11-11-2 overall and 9-7-2 in Hockey East play while Merrimack falls to 7-13-4 with a 4-9-2 conference mark. - The Terriers scored one goal in each period, beginning with a power-play tally from freshman Brady Tkachuk at the right crease that came at the 12:28 mark of the first. - Carpenter pushed the lead to 2-0 just 3:58 into the second when he finished off a perfect pass from freshman Shane Bowers on a rush. - Merrimack got on the board with 1:46 left in the middle stanza as Ludvig Larsson took a feed from Cole McBride and buried a shot while streaking across the goalmouth. - That was the only shot the Warriors were able to get past BU netminder Jake Oettinger, who stopped 26 of 27 shots on the night. - Carpenter capped his fourth multi-goal game of the season midway through the third, receiving a pass in the right slot from junior Jordan Greenway before turning and firing a shot to the top of the cage. - The Terriers are now tied for third with Providence in the Hockey East standings with 20 points. - This was BU's first two-win weekend of the season. - Greenway, playing in his 100th career game, earned the primary assist on both of the Terriers' power-play goals. - Freshman Ty Amonte earned his second assist of the weekend. - Only six teams have longer current unbeaten streaks than BU (3-0-1). - BU honored longtime equipment manager Mike DiMella for reaching 1,000 career games with the Terriers. - The Terriers will return to action next weekend when they head west for a pair of contests at Arizona State. - The first-ever meeting between the two schools will take place at Gila River Arena, home of the NHL's Arizona Coyotes, on Friday (Jan. 26) at 9 p.m. ET.